Ad Astra Games produces games – science fiction, air combat, and even little RPGs. Many of our games, following from Attack Vector: Tactical through Birds of Prey and Squadron Strike, use 3D movement. Our games have won industry awards and rave reviews from places as diverse as Undefeated and Scientific American. We also produce licensed products, such as Power Projection: Fleets and the upcoming Squadron Strike: Traveller. Show Me How to Win! Ken Burnside sat down with the Show Me How to Win! YouTube show for a quick demo of Squadron Strike. Check it out! Ken Burnside and Traveller line developer Michael Llaneza play Squadron Strike online, showing off the amazing new play-by-Internet software. You get to see how the game plays and hear about the development Traveller for Squadron Strike. Click through for the full post, or go right to the video. Congratulations again to our friends at the Stars' Reach miniatures Kickstarter for hitting their first stretch goal. Every fleet box is going to have an extra heavy cruiser--for free! Stars' Reach Miniatures Kickstarter--Join in Now! Ad Astra Games is excited that the Stars’ Reach miniatures Kickstarter is fully funded and is surging toward exciting stretch goals. (Getting more miniatures for free is pretty exciting!) To show our support, we’re producing a Stars’ Reach supplement for Squadron Strike. Do you like your Cold War safely in the "distant" past of the 1980s? Have you always yearned for the timeline where the Apollo program was a cover for Project Orion? New AVID Assistant Codebase Open Beta! We're having a moving sale from now until the 23rd of May! Come help us pack by reducing what we have to pack! Nobles and spacers of the Imperium! We have Zhodani incursions in District 268! Report to your information officers for a full briefing! Ken will be at TotalCon (in Massachusetts) this coming weekend - February 19-21st, and then at Fire & Ice (in Wisconsin) the next weekend - February 26-28th. Click Read More to find out about the surprises Ken will have with him! Patreon is a steady-trickle crowd-funding service. Ken previews upcoming products there. Birds of Prey Patreon campaign. Subscribe for News and Product updates. We respect your privacy, we will not sell your email address. Begin your shopping trip with this link or any of the ad links on below, and Ken gets up to 8% of what you spend at Amazon.com at no additional charge to you. You can start from the carousel shown below (turn off Ad-Block if you don't see it.) It's got links to products Ken wrote or contributed to that we don't sell here. Attack Vector: Tactical is the award-winning game of 3D spaceship combat. Command heavily armed and realistically modeled warships hurling kinetic weapons in a bullet-speed ballet of maneuver denial. Feel the crack of of high energy lasers drilling through your armor as you try to get position and timing right for a counter-strike without flying suicidally through a cloud of depleted uranium penetrators. Best described as a combat flight simulator with spaceships, Attack Vector: Tactical sets the bar for realistic and playable space combat in a boardgame. Each decision you make will have serious consequences down the line, but the award-winning play aids handle all the scary math so you can blow things up. Ideal Scale: One to two ships per player. Time to Learn: 2-5 hours. The most realistic non-computerized flight simulator on the market Birds of Prey is the critically acclaimed game of modern jet combat. Clever use of nomograms and laminated play aids give you unprecedented detail and accurate flight dynamics, all from a consistently reasoned out and modeled aerodynamic model. Gone are the days when half the maneuvers had to rely on exceptions to rules you already learned, with special cases for different wing configurations or different altitude levels. 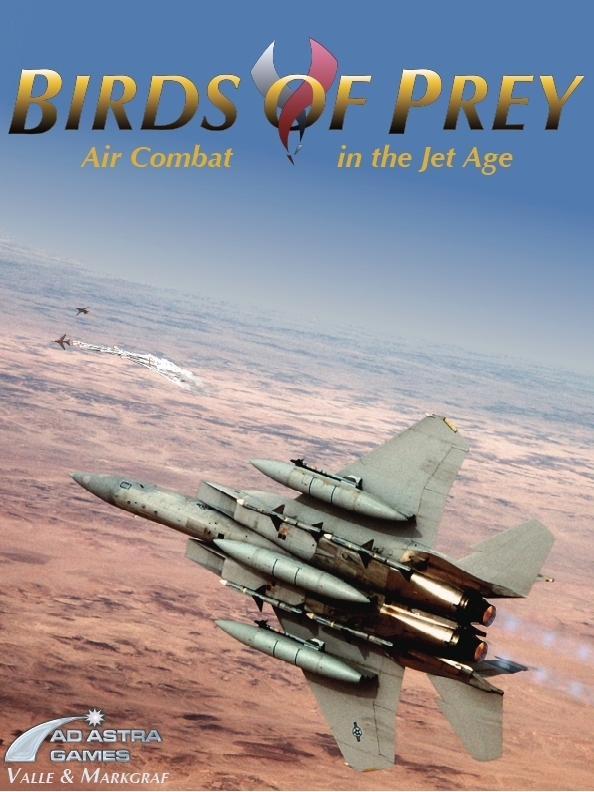 Best described as the most realistic jet combat simulator you can get without a security clearance, Birds of Prey sets the bar for realistic and playable jet combat on the tabletop. Every decision cascades, and it's the only air combat game that can actually show subtle differences between different blocks and nationalities of commonly used aircraft. Ideal Scale: One to two planes per player. Time to Play: 2-4 hours. Time to Learn: 3-8 hours.